The Invader III is the newest version of Tesla's popular box mod series. It comes in a sturdy box with a velvet interior. The kit includes: an instruction manual, a certificate of inspection card and the Invader III 240 watt box mod. The body is made of light-weight zinc alloy. It's roughly 3.5 inches tall by 2 inches wide and it's spring-loaded 510 threaded. It comes in three colors: Black, Stainless Steel and Blue. 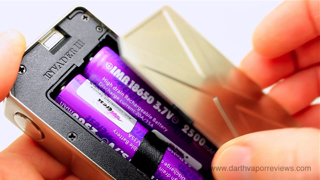 The Invader III requires two 18650 high drain batteries that are not included in the kit. It is recommended that you use batteries that discharge at 30 amps or above. 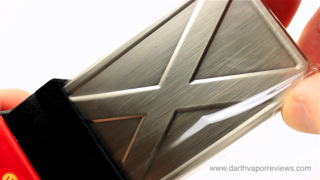 The battery cover is marked with a large X design. It is held in place by two very, strong magnets. Battery vent holes are located on the bottom next to the battery cover lift tab. remove the battery cover and install the batteries in series. Large + and - icons marked on the inside make it easy to install the batteries correctly. Replace the battery cover. Five clicks of the power button will turn it on and off. The blue LED light will flash three times to indicate that the device is on. To adjust the voltage, rotate the knob to the desired setting. Labeled in Roman Numerals from one(I) to five(V), one would be 3.7 volts and five would be 6.6 volts. The Invader III features a Tesla chipset to protect against issues that may arise and it has a 10 second cut-off mode. I like the look and fell of the Invader III. It kind of reminds me of a Jeep gas can. It's slightly heavy, which is fine with me, but some may not like that. It has a 240 watt output which is probably enough power for anybody. It has no LED screen so this would definitely not be for beginners. I like the built in Tesla microchip for protection. Especially, with 240 watts. 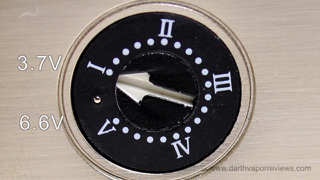 My biggest con would be with the dial. It's a set it and forget it design. Overall, for the price, this is not a bad mod for advanced vapers to add to their collection. * Dial hard to adjust. Tesla e-Cig Group is a top branded electronic cigarette manufacturer in China focusing on high quality,technologically advanced vape devices, and innovative designs. We continually invest in research and development and quality control measures to ensure our products are not only safe but built to last. 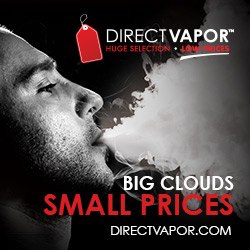 As part of our ongoing commitment to researching and developing the best quality and leading technological vaping devices, we encourage our vape community to provide comments and reviews of our products. T-Social is our forum to discuss vape experiences, vape product reviews, and general vape comments. when it works continuously for more than 10sec.